tl;dr I’ll be *****ed if I will use such a cliché. This post is a bit techy, and is mainly for WordPress tinkerers, aimed to help explain something in an email I am sending Tom. But hey, you never can know if someone else is trying to do something like this. Hopefully you can know the difference between a WordPress Page and Post, or a web page and a WordPress Page. Simple, eh? There are times when it’s useful for me to have something that presents a URL on my WordPress site that looks like its part of the site as a Page but redirects the visitor elsewhere. This is not needed for WordPress menus, where you can code a URL into a menu as a link. It’s really meant for sites where I list a series of pages, and I want to have that external one included in the mix. 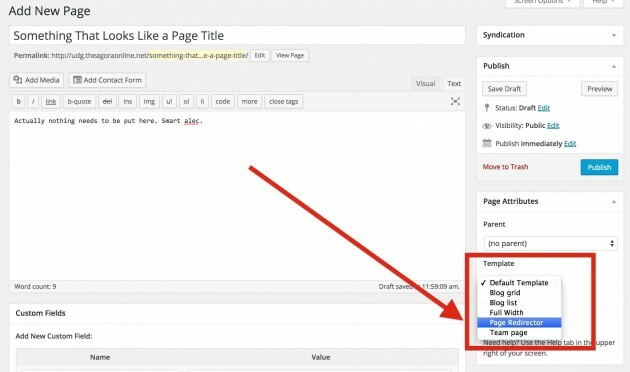 Most often, it’s when I use the Page List plugin to create an index to a series of pages, and I want to include something that’s actually not on my site. Sure I could just make a stub page with a “go here” link but #lame. Page holder that transparently sends the viewer elsewhere via url in custom field. It looks for a custom field named redirect and will divert the browser there before any WordPress stuff appears. In use, you create a new Page, and from the Template menu in the bottom right, select Page Redirector. This says, ‘Don’t do what WordPress wants to do, do what Alan wants to do’. Name the page whatever you want it to look like when pages are listed. It needs no content. Now you need to add a custom field. If you do nott see that below the fold, hit the Screen Options thing in the top right, and check the box to tell WordPress you want to see them (you should only need to do this once). If you every do this again, the redirect name will now be available on the drop down menu of available custom field names. Now, if you every click a link to this page, you go instead to the URL you put in the custom field. This gets really nifty when you use the Page-List code for generating a graphic index of the pages you want to show (pagelist_ext shortcode). What’s neat here is that the same redirector will do its thing, but you can add a featured image to the page (used in the shortcode), and the content you use in the Page (now use it) becomes the description text. 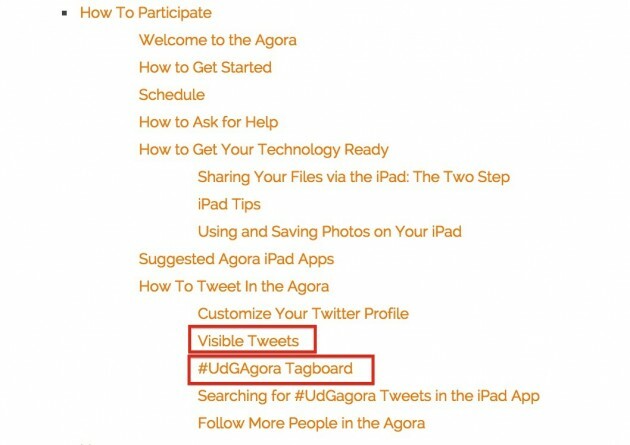 For example, on the UdG Agora How to Participate page at http://udg.theagoraonline.net/how/ the first item for welcome looks like it is a sub page http://udg.theagoraonline.net/how/welcome/ but actually it redirects to the site’s About Page (thus saving me from copying content) (because most of my tips are written for me). Chance are you never need to use this; but I rely a lot now on the Page-List plugin to generate indices of Page structures on my site. That saves time too in creating navigation lists because it is generated dynamically based on your Page structure. Top / Featured Image credit: Public Domain image by Hans on pixabay https://pixabay.com/en/spectrum-light-spectrum-optics-113364/. I have to say that pixabay is a real goto these days for good, reusable images. I don’t want to be that guy. But did you try the Page-Links-to plugin? You are that guy ;-) I cannot remember if I have seen the plugin, but yes it does the same thing. Here’s my rationale. I try to be parsimonious on the plugins for the load they put on the whole stack. But can I see the little bit of code I run in a php template has less impact than similar code in a plugin? I might say that the plugin gets loaded on every access on the site, even where it is not needed. But more importantly, in trying to figure this out in code, I am always amping up my understanding of WordPress. If I reach for the plugin first, it’s like just knowing there’s an engine under the hood rather than poking around in it with your hands. Plus this was easy to do, it took me maybe 15 minutes max from idea to code. If I struggled, I might have pulled my head out and looked for a plugin. But I see lot of plugins that do stuff just as easily rolled into a function. 6, half of a dozen, makes no difference to the person clicking the link, right?